William Ragsdale, Amanda Bearse, Stephen Geoffreys, & director Tom Holland from FRIGHT NIGHT (1985). Ted White, Peter Barton, Lawrence Monoson and Judie Aronson from FRIDAY THE 13TH PART 4: THE FINAL CHAPTER. Dozens more from your favorite horror movies & shows! Makeup photo-op featuring Stephen Geoffreys (Evil Ed) in his evil vampire makeup designed & applied by FX legend Steve Johnson. Outdoor Horror Film Fest featuring CHILD’S PLAY and FRIGHT NIGHT (1985) on a GIANT Outdoor screen hosted by our celebrity guests! 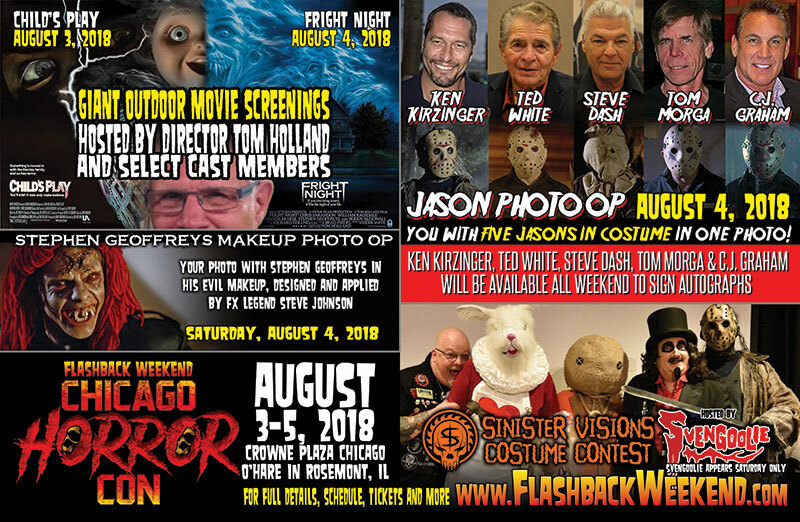 HUGE vendor room featuring horror memorabilia, collectibles, apparel, accessories, dark art and more! …and so much more macabre merriment it’s SCARY!